A grand addition to the 12th Main in Indiranagar, Delhi Highway is a vegetarian North Indian restaurant that gets the food right. Décor is bright and bordering on ostentatious, but it’s pleasant enough. 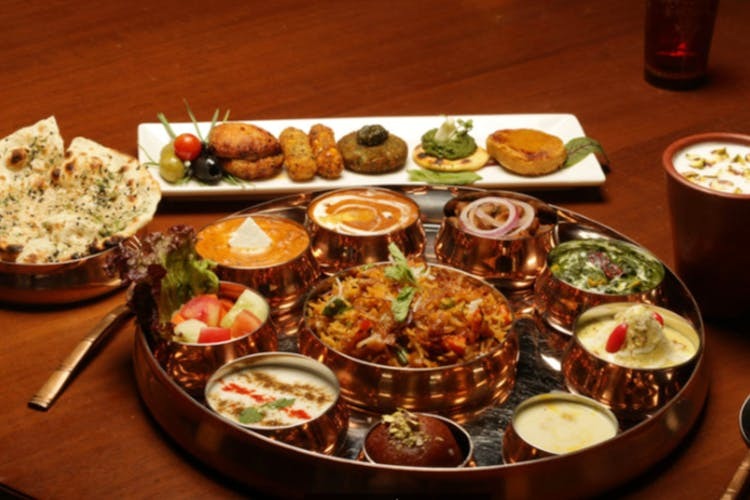 If you’re looking for North Indian food that’s authentic, this one’s for you. And being a vegetarian place, it really stands out. Plus, in an area where there’s so much international food going around, this desi restaurant is not out of place. Regal, bright and created to be like a royal Delhi durbar of bygone days, Delhi Highway has decorated marble arches, jharokha-style wall carvings, and spread out furniture, giving you enough privacy. While gold, blue and white dominate the space, it does seem a bit in your face. But hey, better than dimly lit restaurants where everyone needs to shine their mobile phone on their plates. Paneer Platter is great as it gives your bite-sized pieces of all their tikkas – from achari and Afghani to pesto and chipotle. Cheese Aloo Tandoori is indulgent and tasty, though a tad bland. Dal Delhi Highway is a house special dal makhani and is best had with tandoori roti or soft kulchas. There’s also a fusion section offering phulka tacos, tandoori paneer quesadillas and even makhani pasta – very different and quite palatable, despite my scepticism. It’s a great place to head to with the family. While I enjoyed my meal here, there are far too many people hovering around. They mean very well, but it is a little intrusive when they interrupt you before or after every bite!